Phil Hines & his Cousin Hugh are embarking on an ambitious fully-laden cycle touring holiday. Updates on their progress will appear here as and when available....... Good Luck Guys. Hope you are well. This is the second round robin installment of my travels, feel free to respond with any queries or comments. I believe i stopped in Dunedin so that's where I'll pick it up. A fair bit has happened since then so ill just give an illustrated overview. After my luxurious stay in Dunedin, i was actually chauffeured out of Dunedin, and past two considerable hills, which made he days ride a bit easier. I was riding into a territory called Otago, a sort of desert like landscape of extremes, it holds the crown as the coldest and hottest place in NZ. The landscape slowly alters into a moonscape, when i arrived in a small town that sat at the tail of the Otago central rail trail. 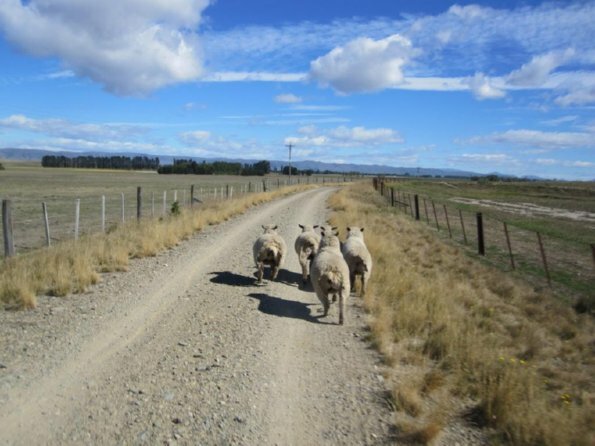 The rail trail is a disused railway track stretching 160 odd km across the Otago district, which has been recommissioned for the cyclist. This, i decided, would be a traffic free and scenic route to take. However the chap who oversaw the recommissioning, clearly as not a cyclist. The path material they chose was large gravel with variable rock sizes, which on a touring bike meant that i had to spend most of the time looking where i was going rather than the scenery. After a night camping out alone in the middle of nowhere, and a night in a hostel in the middle of nowhere i completed the rail trail. I then had a spectacular ride to the beautiful Queenstown, interspersed with wine tasting. Where I spent 5 nights in whilst i waited for a space in the campsites of the Routeburn 'Great walk' to become open. Me hearing sheep on the Otago rail trail... who need a dog when you have a bike. Having had to pay a considerable premium for my travel insurance to cover me above 2000 meters i felt duty bound to reach such a height. So i decided that i would attempt to ride unloaded to the ski fields of the remarkable mountain range, which had an accessible peak of 2300m....perfect. After around an hour of hard climbing, i realised that my three water bottles were no way near enough, so i rationed the remaining water, and pressed on. About 2km before the top and at 1600m, the heat and the effort turned the situation critical, with no water left i reluctantly turned round and started my descent. Things worsened on the descent as the road was of a similar consistency to the rail trail, except it was rutted. This has a lesser effect to that of descending on ice. Needless to say the descent was exceptionally stress full, and i came out slightly shell shocked for the rest of the day. 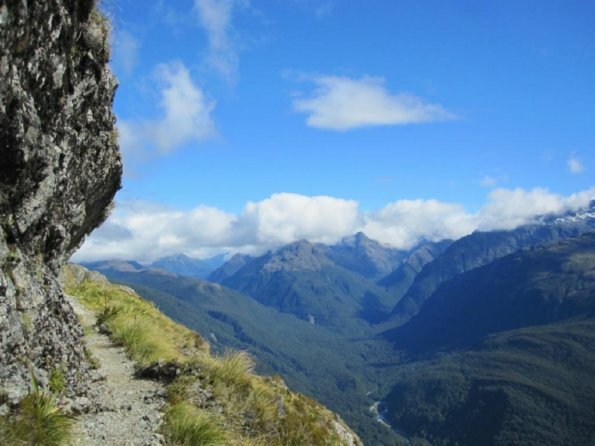 Finally i was able to embark on the Routeburn "Great walk', which is a three day hike through a rather large national park. I did it with a German couple that i met whilst hitchhiking to the start. The walk was tiring, but good fun, and had some spectacular scenery. Having had to leave the bike in Queenstown, I hitched to the spectacular, but extremely touristy Milford sound, and took a boat tour, where i negotiated a reduced price for a bus back to Queenstown. I was then able to get back to doing some good old fashioned touring. Taking the highest highway in NZ to the also beautiful lake side town of Wanaka. 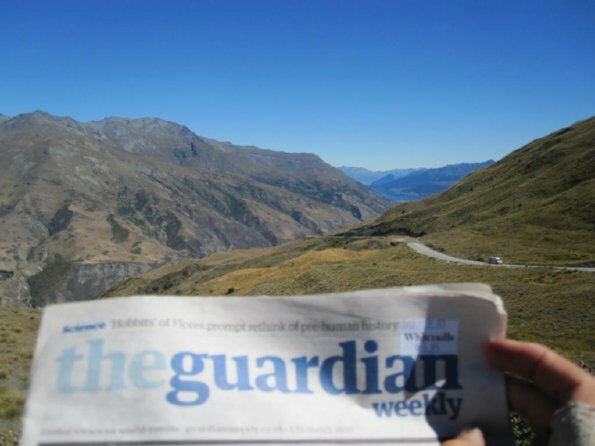 There were to be no supermarkets for two days, so i stocked up on supplies, and headed out, camping as usual in the middle of nowhere, and then arriving after the spectacular Haast pass through the alps, to the coast. Finding a Hostel and a french couple touring by bikes, we headed out into the inevitable rain that is a draining side effect of temperate rain forests. The next 6 days were spent cycling mostly though rain, receiving some horrified look from passing drivers. I cant remember too much of the scenery to be honest, as i think the low cloud detracted somewhat from the mountain views. Never the less i reached the top of the coast, after passing through some lonely small towns and deserted roads, with wet clothes, wet tent but an ironically sunny disposition. After the west coast the sunny north came as a welcome change. The scenery was as usual spectacular, as i rode to a town called Motueka, which acts as a gateway to NZ's most popular great walk the Able Tasman. 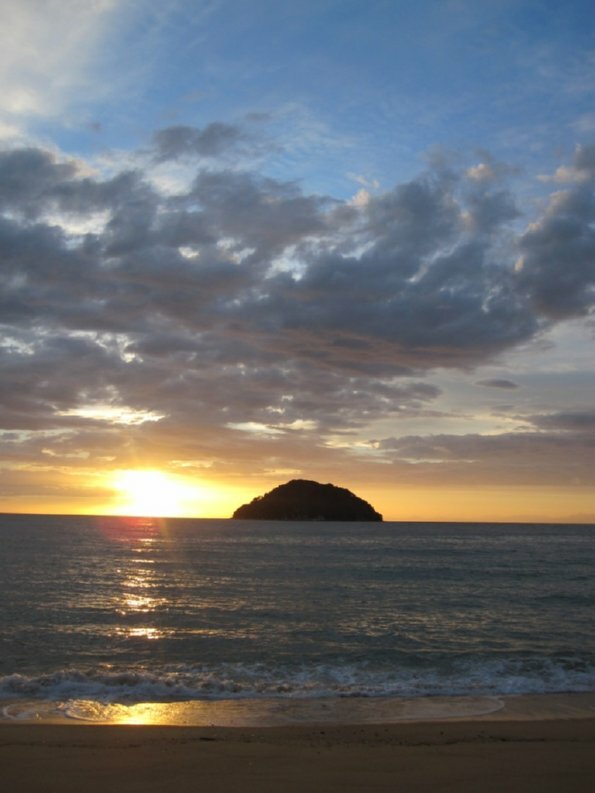 I completed the Able Tasman, walking with another German couple, staying in deserted golden beaches. I then had a brief ride through Richmond, which i can report, disappointingly fails to compare with the original. The sunny weather and spectacular scenery continued as i rode up north through, what i consider to be the nicest city in NZ - Nelson, and onto Picton. I arrived in wellington, after having taking the spectacular ferry ride through the Sounds. However all the hostels in town were booked so i rode to one out of town where i spent the next four nights using it as a very nice base for exploring Wellington. I call Wellington a town with purpose, because although it is a city, it just doesn't have a city feel. I had been informed to take the bus from Wellingotn to Napier as the ride was nothing special, and i was running out of time. However the bus drove off without me, and so i was forced to stay another night. Arriving in Napier i then headed up towards the central plateau, and Taupo. On the way i camped by a hot pool in the middle of nowhere, which is a nice feature to have when camping. 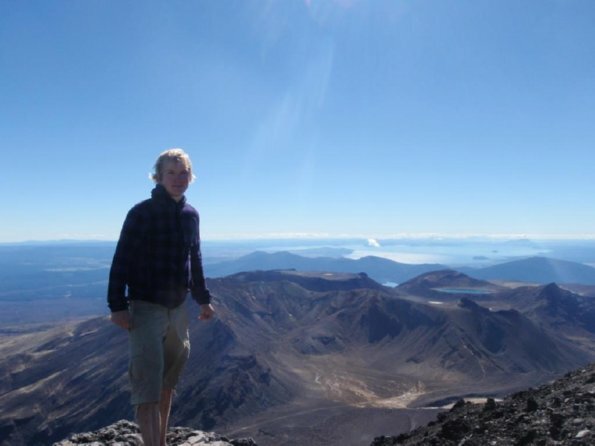 Then i rode to the picturesque Taupo and embarked on the Tongariro Crossing 'Great Walk'. The walk was a 20+km day walk, and supposed to be one of the most dramatic in the world. It had an optional scramble up the peak of an active volcano, which I was delighted to see peaked at 2300m altitude. So explaining my need to reach the 2000m altitude cap to the Estonian girl i was walking with we embarked up the face of this volcano. It was a scree slope, so you could think of it as waking up the face of a 2300m sand dune, except every now and then there would be calls from above/below you of "ROCKS! ", as someone dislodged a rock, and it would come bouncing down towards the fellow climbers. Two girls above us went into shock and had to turn back as a falling rock smashed into one of there rucksacks. When the summit was finally reached, the views were some of the most spectacular i have seen in my life. Getting down was also similar to a giant sand dune, as you just ran/fell down the scree slope. After Taupo i headed North and stayed with a Twickenham cycle club connection, in a very cycle friendly home to say the least; the bike shed was bigger than most garages. On my way to Rotarua, i had a day visiting hot springs and rivers. In total, i think i must have traveled to 6 hot pools, and various other geothermal abnormalities. 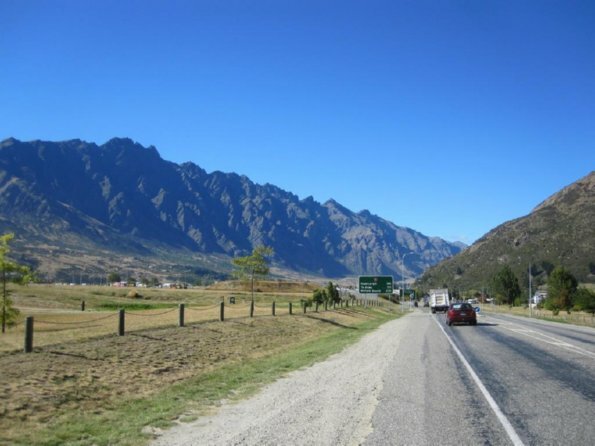 I stayed with another keen cyclist in Rotarua, and then departed for Tauronga, with which my accommodation standards decreased, as i stayed in a cramped noisy dorm in the only bad hostel that i have visited in NZ. Following advice/orders i took a bus to the base of the Coromandal peninsula, rather than riding highway 2: the "death highway". I spent a couple of days riding up north through the hills and bays before doing a final descent. Just before a corner on this descent i decided that past experience had shown me that the corners which stated a maximum speed limit of 35kmh, could in fact be more successfully achieved at 55 kph, naturally i set out too prove this. I wasn't successful however and so found myself sliding along the floor and into a road barrier. The front of my bike acted like a crumple zone, so all i sustained was a healthy road rash down the right side of my body. My bike on the other hand had a snapped fork, front rack, rim (in three places! ), a twisted stem etc. Soon enough a van came, and after seeing the bike and the blood offered to call and ambulance or transport me to the hospital, knowing that ambulances didn't carry bike racks i opted for the latter and spent the next day in the care of a family that took pity on me in the surgery's waiting room. 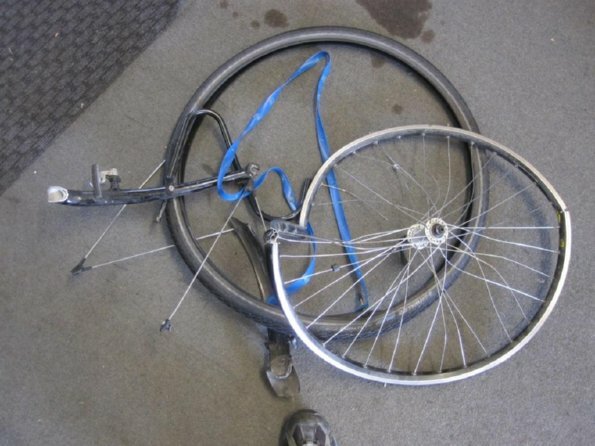 After sorting out insurance, I got the bus into Auckland in order to fix my bike. I spent around 5 days staying with a family friend, and looking around before the kind mechanic fixing my bike offered to lend me part of his bike so i could do a quick three day tour up north, which i did and greatly enjoyed. I then returned to Auckland and boxed my bike before flying out to Sydney, where i am now, staying with yet another family contact, in yet another nice town, having yet more good times. Alcohol consumption: Dropped way down to about a glass.